A stretch wrap dispenser is used to manually apply stretch film for bundling and palletizing operations. Hand Held Stretch Dispensers can be used with bundling film and hand stretch film. Pigmented type Inks recommended for use on porous or non-porous surfaces with the Rol-It-On type N roller and Oneshot stencil systems. 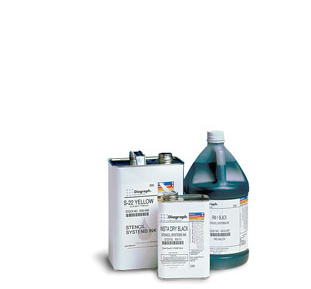 Pigmented type Inks recommended for use on non-porous surfaces with the Rol-It-On type N stencil roller. S type Inks are a pigmented dye to be used on HV and Rol-It-On (RIO) Type N Rollers.They are lightfast. Resistant to oil, water, and some solvents after drying. Requires agitation. Pigmented Inks are specially formulated for use on difficult-to-mark surfaces like plastic and rubber. Recommended for use with Rol-It-On type N roller.